Although he is the Lord of the creation, Virabhadra Prabhu presented himself as a great devotee. 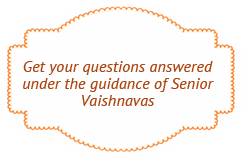 Though transcendental to all Vedic injunctions, he strictly followed the Vedic prescripts. Though the power of God was operating within him, out of sight to the world, he showed no pride. He is the main pillar holding up the edifice of devotional service to Śrī Chaitanya Mahāprabhu. Kshirodakashayi Viṣṇu, the expansion of Sankarshan who sleeps on the ocean of milk, has become Virachandra, the son of Nityananda Prabhu. He is non-different from Chaitanya Himself. The Supreme Personality of Godhead, Śrī Kṛṣṇa, is the origin of unlimited expansions and avatāras. 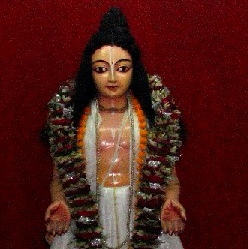 He is the avatārī. His first expansion is the root Sankarshan or Balaram. This same Balaram appeared with Lord Chaitanya as Nityananda Prabhu. Balaram’s expanison Maha-Sankarshan has His abode in the Vaikuntha planets, and He in turn expands as the puruṣāvatāras in the work of creation of the universe, first as the Karanodakashayi MahaViṣṇu, who lies in the causal ocean, then as Garbhodakashayi Viṣṇu, who lies in the ocean within the individual universes, and finally as the Kshirodakashayi Viṣṇu, who not only lies in the ocean of milk, but is the director of the individual universe and is present as the indweller of every living being within the universe. Also known as Aniruddha, Kshirodakashayi Viṣṇu appeared in the course of Mahāprabhu Śrī Chaitanya’s pastimes as Virabhadra Prabhu, the son of Lord Nityananda Prabhu and His energy, Vasudha Devi. Kṛṣṇa Das Kaviraj Gosvāmī has written in his Chaitanya Charitamrita that Virabhadra is the best of all the branches of Nityananda Prabhu trunk of the Chaitanya tree. The best of all of Nityananda Prabhu’s branches is Virabhadra Gosvāmī. The sub-branches which grew out of him are unlimited in number. As with all Viṣṇu-tattvas, the three energies, Śrī, Bhu (Bhakti), and Nila (Lila) Shakti, were all present in Virabhadra Prabhu’s life. His Shri Shakti was named Srimati, who appeared in the village of Jhamatpur in Hooghly district as the daughter of Yadunandan Acharya and Vidyunmala (Lakshmi). Virabhadra Prabhu, the son of Nityananda Prabhu, was an ocean of virtue and redeemer the world. There is no limit to his glories, so can sufficiently glorify him? He is famed as the branch of the Nityananda Prabhu. The root of all joy, he is sometimes known as Virabhadra and sometimes as Virachandra. If anyone sees him even once he will give up everything and make his lotus feet his all-in-all. According to the thirteenth chapter of the Bhakti-ratnākara, Virabhadra Prabhu took permission from his mother Vasudha to go to Vrindavan. Upon arriving there, he performed Vraja Dham parikrama with the blessings of Bhugarbha Gosvāmī and Śrī Jiva Gosvāmī. The old Shyamasundar temple in Khardaha has a manuscript of Śrīmad-Bhāgavatam that is hand copied by Virabhadra Prabhu. Some hold that this was actually written by Nityananda Prabhu Himself. Virabhadra Prabhu personally brought a piece of stone from which the deities Shyamasundar, Radhavallabha, and Nandadulal became manifest. These deities are still worshiped in Khardaha. The ghat where this stone arrived is known as Shyamasundar Ghat. Virabhadra Prabhu established the custom of celebrating the birth of Nityananda Prabhu at Khardaha. During his time, the offerings during the festival were prepared using 60 kgs of rice and equal amounts of other materials. The current managers of the Khardaha temple have many other legends about the life of Virabhadra Gosvāmī. The date of Virabhadra’s appearance is given as Kartik kṛṣṇā navamī. The Gauḍīya Vaiṣṇava Abhidhāna, however, gives the date as Agrahayan śuklā caturdaśī.